Our postcards feature the photography of Robert E. Benjamin. We are adding new images to our collection each season. Purchase our popular 12-postcard pack! 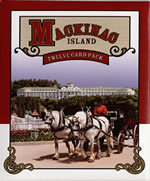 Our package of postcards include popular views of Mackinac vistas, Fort Mackinac and, of course, horses! The pack (PN01) includes the postcards below.